The Chinese Communist Party's attempt to allow President Xi Jinping to rule indefinitely set off harsh criticism in China, as well as international opprobrium. But the power grab appears to have at least one fan: Donald Trump. "He's now president for life. President for life. No, he's great," Trump said of Xi at a lunch and fundraiser at his Mar-a-Lago estate, according to CNN, which obtained a recording of the remarks. "And look, he was able to do that. I think it's great. Maybe we'll have to give that a shot some day." Context, of course, is everything. 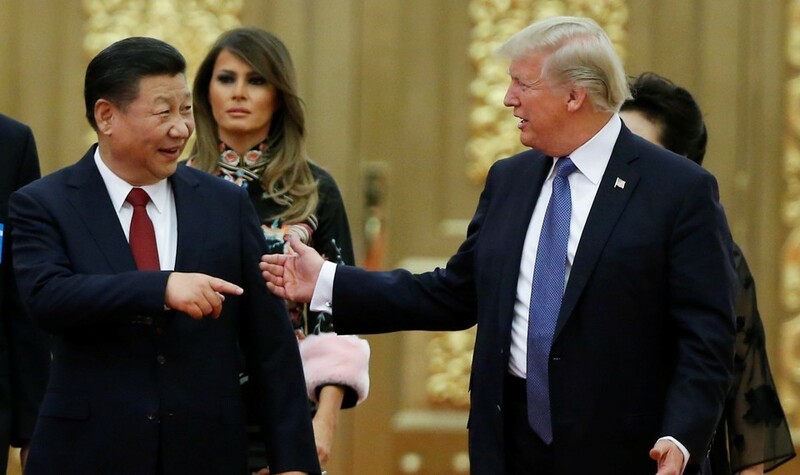 Trump may well have been joking (CNN hasn't yet released the audio of the remarks), but his comments about Xi's hold on power in China, a Communist dictatorship, add to Trump's long history of offering support or even outright praise for dictators and strongmen the world over. What Trump said about him: "If he says great things about me, I'm going to say great things about him. I've already said, he is really very much of a leader. I mean, you can say, 'Oh, isn't that a terrible thing'—the man has very strong control over a country. Now, it's a very different system, and I don't happen to like the system. But certainly, in that system, he's been a leader, far more than our president has been a leader." Context: The remarks weren't the first time Trump expressed his admiration for the Russian leader. He'd done it well before he announced was running for president, and before interference in the U.S. election system was a glint in Putin's eye—as well as many times afterward. But praising Putin's strong leadership in a country where the Russian leader's political opponents are harassed, jailed, or simply disappear is a bit like praising the punctuality of the railways in a fascist regime. The U.S. State Department, in its most recent human-rights report, described restrictions in Russia on political participation; the suppression of civil society; and allegations of torture. Human Rights Watch said that the government had "tightened control over the already-shrinking space for free expression, association, and assembly and intensified persecution of independent critics." The Russian presidential elections later this month, which are expected to result in another term for Putin, all but ensures that this trend will continue for the foreseeable future. What Trump said about him: "I just wanted to congratulate you because I am hearing of the unbelievable job on the drug problem." Context: The Philippines president has boasted about killing suspected drug dealers when he was a local mayor. Extrajudicial killings of drugs suspects have risen since Duterte became president in June 2016. Trump reportedly favors the death penalty for drug dealers—presumably ones who have been convicted. The U.S. State Department noted last year that "police and unknown vigilantes have killed more than 6,000 suspected drug dealers and users as the government pursued a policy aimed at eliminating illegal drug activity in the country by the end of the year." Human Rights Watch said "Duterte has plunged the Philippines into its worst human rights crisis since the dictatorship of Ferdinand Marcos in the 1970s and 1980s." It added that Duterte's most prominent critic was detained on "politically motivated drug charges." What Trump said about him: "Frankly, he's getting very high marks. He's also been working with the United States. We have a great friendship and the countries—I think we're right now as close as we've ever been … a lot of that has to do with a personal relationship." Context: The president's remarks came shortly after Erdogan cracked down on Turkish civil society, the media, and his opponents. Erdogan accused members of democratic institutions of being part of a failed coup attempt against him the previous year. Trump even congratulated Erdogan after last year's referendum that gave him—and subsequent presidents—more power. The U.S. State Department has cited "inconsistent access to due process" in Erdogan's Turkey, along with other abuses against civil society. Human Rights Watch called the new presidential system "a setback for human rights and the rule of law." Trump's "personal relationship" with Erdogan appears to have its limits, however. Turkish forces are pounding a Kurdish-controlled Syrian town despite pleas from the U.S. to obey a 30-day UN-mandated ceasefire. What Trump said about him: "We agree on so many things. I just want to let everybody know in case there was any doubt that we are very much behind President el-Sisi. He's done a fantastic job in a very difficult situation. We are very much behind Egypt and the people of Egypt. The United States has, believe me, backing, and we have strong backing." Context: Sisi, who seized power in a coup, has cracked down in Egypt, where a brief flirtation with democracy during the Arab Spring resulted in a Muslim Brotherhood-dominated government (which Sisi ousted). The U.S. State Department says the most serious human-rights problems there involve "excessive use of force by security forces, deficiencies in due process, and the suppression of civil liberties." Human Rights Watch says Sisi's government "maintained its zero-tolerance policy towards dissent… and [continued] near-absolute impunity for abuses by security forces under the pretext of fighting 'terrorism.'" Trump's fondness for authoritarians may have more to do with how power is wielded than those who exercise it. It just so happens that Western governments have, for the past seven decades, mostly adhered to a system of the rule of law, which empowers institutions rather than individuals. Trump's apparent preference is for a system in which one individual, presumably him, wields that power. Indeed, his fondness for strongmen and dictators isn't limited to Xi Jinping or any other individual in power now. He has praised Iraq's Saddam Hussein (while also criticizing him as "a bad guy") for killing terrorists. "He did that so good," Trump said in July 2016. "They didn't read them the rights. They didn't talk. They were terrorists. Over." Trump also said in 2016 that Libya would be better off "if [Moammar] Gaddafi were in charge right now." He once tweeted a quote from Benito Mussolini, the Italian fascist leader, and later defended the tweet, saying: "Mussolini was Mussolini ... It's a very good quote. It's a very interesting quote... what difference does it make whether it's Mussolini or somebody else?" Trump even said China's brutal crackdown on protesters in Tiananmen Square in 1989 "shows you the power of strength," contrasting the Communist Party's action with the United States, which he said "is right now perceived as weak." Trump made those comments in 1990. When asked about the remarks during the presidential debate in 2016, Trump defended himself and appeared to take the Chinese Communist Party's view of the events at Tiananmen. He dismissed the deadly military response as a "riot."